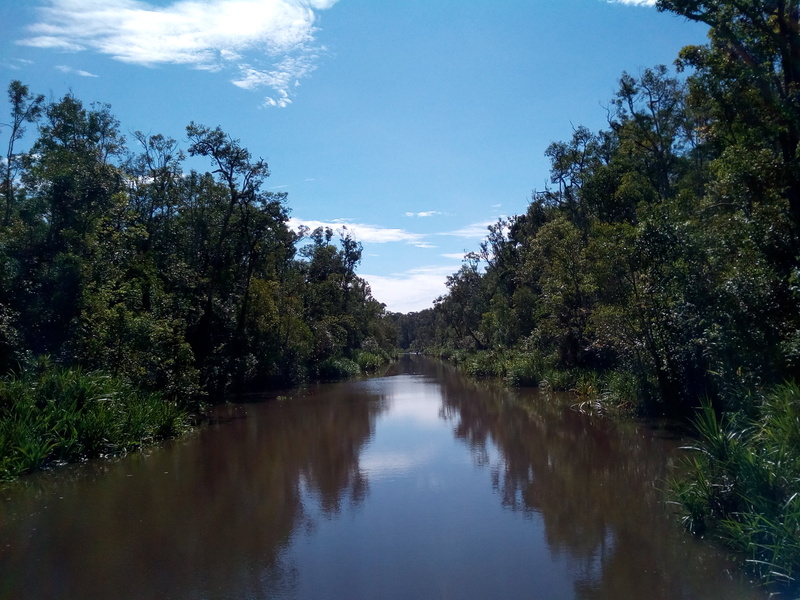 Boating in Borneo: A Ride on the Wild Side – Where in the world is Kelly? I grew up on a steady diet of National Geographic films and magazines, so I almost felt as if I had been to Camp Leaky before. 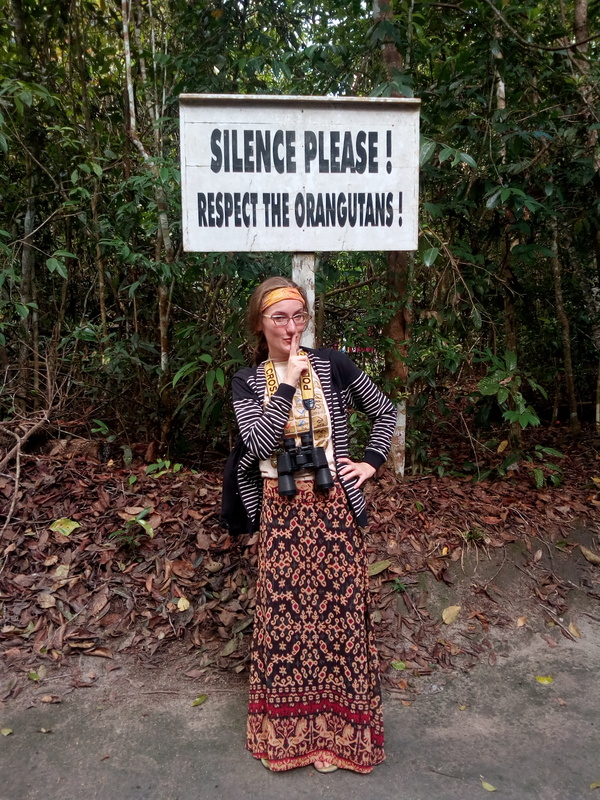 The whirring of the cicadas, the slow movements of the orangutans, the ankle-deep leaf litter on the jungle floor–it all felt so familiar. I even sort of expected Dudley Moore to be there to narrate everything for me. 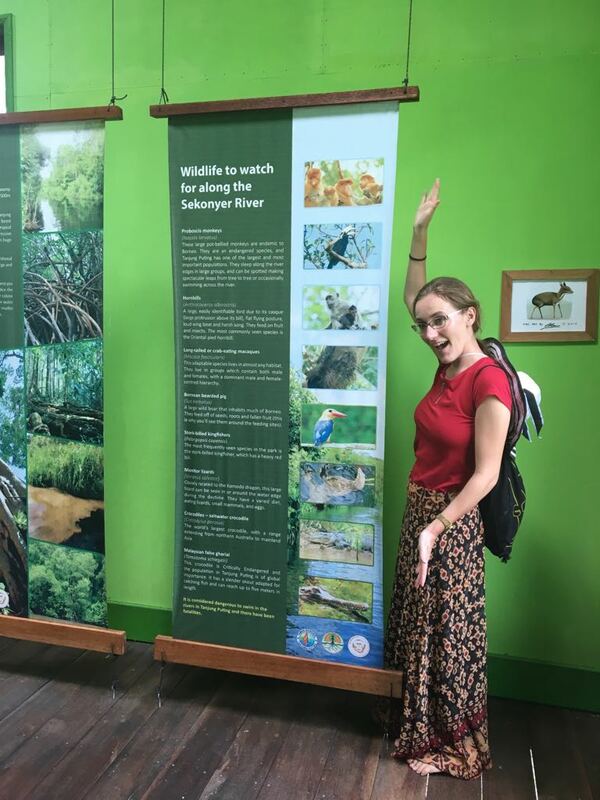 Despite the familiarity, there is one thing of which I am certain: five-year-old Kelly would never have guessed that someday she would step foot on Borneo. Five-year-old Kelly, who decided to become vegetarian because she loved animals too much to eat them, would never have imagined she would see orangutans in the wild. 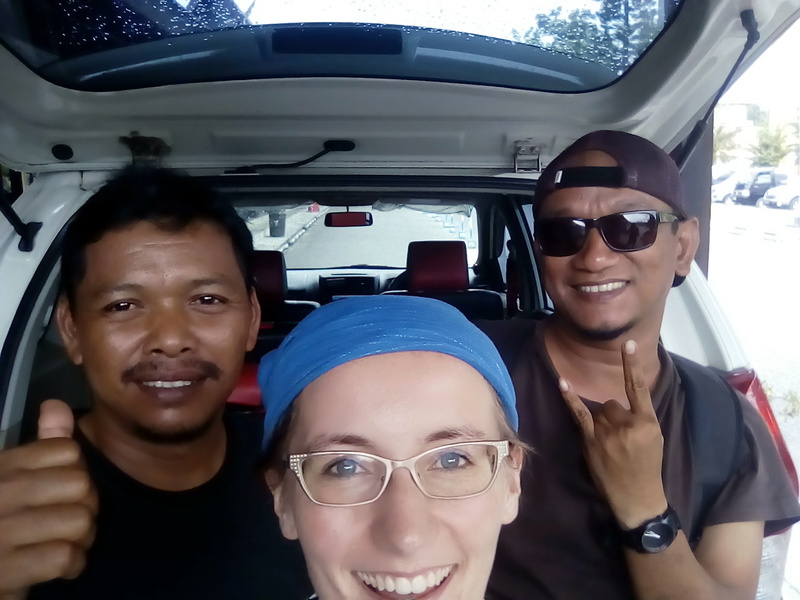 Five-year-old Kelly would never have believed that just twenty years later she would be living in Indonesia and familiar with not just Borneo but also Java, Sumatra, Sulawesi, and other islands that most people know only by the coffee they produce. 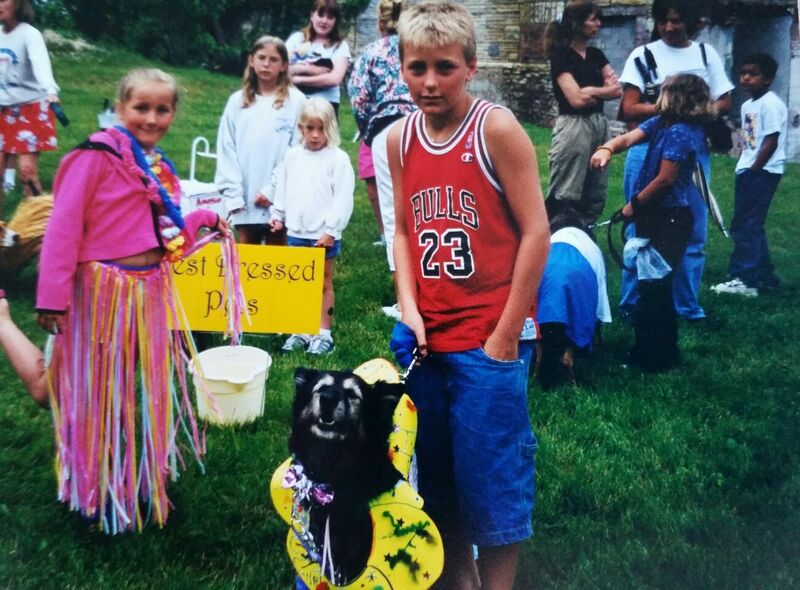 She would never have believed and yet here she is. Life can be strange yet wonderful that way. Last week, 12th grade students across Indonesia took their national exams known here as Ujian Nasional. While the 12th graders were testing, the rest of the high school student body were given a week-long holiday. Incidentally, this meant that the teachers who were not assigned proctoring duties were also on vacation. This includes yours truly, so I decided to join a handful of other ETAs for a boat trip on the Sekonyer River in Borneo. On the morning of April 13th, we convened in the small town of Pangkalan Bun, the launching point for most travel into the lush and wild interior of Kalimantan (as Indonesians know their half of the island). Erwin, who is a local legend and claims to be from Mars, and company picked us up and brought us to the boat that would be our home for three days. We settled in quickly. Still tired from the morning’s travel, I sprawled out on a carpet. 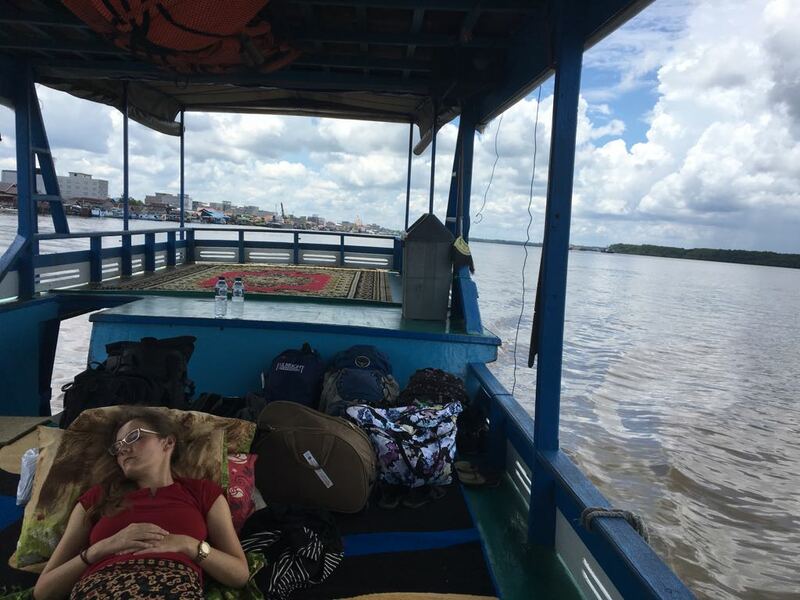 The rumble of the boat’s motor combined with the heat of the jungle quickly lulled me to sleep. I awoke, sweaty and drooling slightly, when the engine slowed and I saw all my friends talking excitedly on the bow of the boat. This was it: our first wildlife sighting! Someone on the crew had spotted a troop of proboscis monkeys in the trees by the riverbank. We came to a stop near them and passed around a pair of binoculars. Most of the monkeys were females with their young, though we did see a few males whose protuberant schnoz gives the species its name. We watched the chattering family for a while then continued to Camp Tanjung Harapan, our first stop for the 3 p.m. orangutan feeding. This was the first of three feedings that we saw. 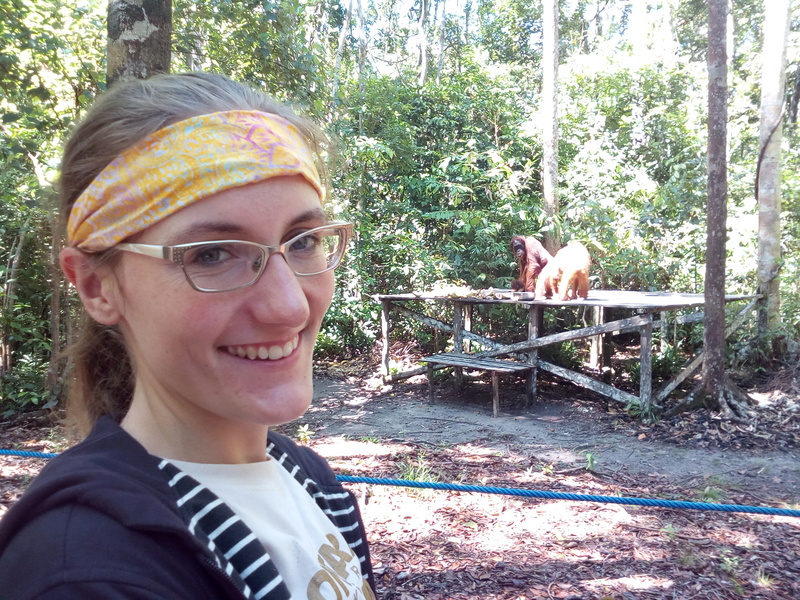 They all happened in the same way: we disembarked from the boat, poked around at a nature center, then hiked a little ways into the jungle to the feeding area. In the feeding area there are planks of wood nailed together to form benches for the audience. Around 20 yards away is the feeding platform, which is made of the same wooden planks and is about 5 feet off the ground and the size of 5 pool tables. Between the two there is nothing but a simple rope and the mindful eyes of the park’s rangers. On the feeding platform there are piles of bananas, pomelos, melons, and any other fruit that is in season and available from Pangkalan Bun. The rangers whoop occasionally to let the local residents know that a bounty is theirs for the taking. Heavily swaying tree branches in the distance announce the approach of an orangutan. Orangutans move more slowly than I imagined, though they are far more agile than they appear. Their joints have an almost full range of motion. They can do mid-air splits with an ease that makes me wince. They also perform miracles with tree branches. Even though an adult female orangutan weighs as much as I do, she can support herself by grasping a mere handful of twigs and leaves. Kids, don’t try this at home. Once the orangutan reaches the feeding platform, most likely with baby in tow, she will promptly start grabbing food and doing what most humans do at 3 a.m. after a few too many drinks: shoveling it down with no thought of the consequences. Baby often joins in the feast with one hand always clinging to Mom. The pair may spend between 2 and 20 minutes on the platform eating their fill and eyeing the other diners. Before departing, nearly all the orangutans take some food to-go. They do this either by shoving a bunch (literally) of whole bananas in their mouth or by peeling bananas one-by-one and popping them into their mouth, which then creates a high-potassium mush ball. If I were an orangutan I’d probably opt for the latter option, though the former is great for a few laughs. 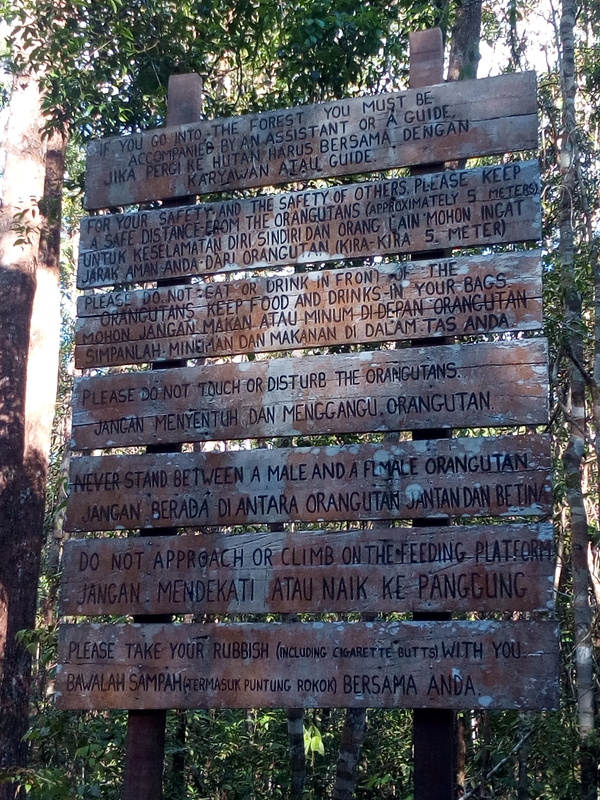 There are just a few rules for visitors while viewing the orangutan feeding. The best orangutan selfie I could get with my cheap phone. Sadly, my actual camera died awhile ago so this is the best I can do for now. The 5-year-old child in me was squealing for joy in the nature center. 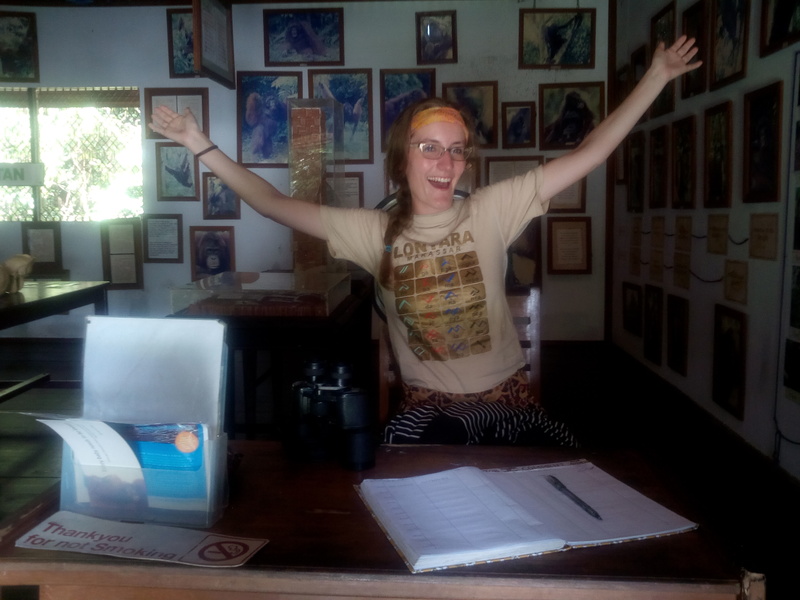 Thrilled to be signing the guest book at Camp Leaky, the main orangutan research headquarters, on April 14, 2017. Erwin and company had their eyes peeled on the river the entire time, ready to point out many of the animals in this list. The second evening Erwin accompanied us into the jungle to look for still more critters. He showed us a cool trick: if you hold a flashlight near your eyes in the dark, you can easily see spider eyes glittering everywhere. It is very cool… if you aren’t creeped out by it. The best part of the night hike was when we all turned our flashlights off and were silent. The moon was nearly full overhead, veiled by thin clouds and the jungle canopy. Below the branches a whole galaxy of lights danced before us. Fireflies, hundreds of them, flickered in a thicket off the trail. It was mesmerizing. I would have been happy to stay for much longer in that place, watching the stars in the jungle compete with the ones overhead. Our boat captain (left) and Erwin the guide from Mars (right) did a fine job taking care of us in the jungle and beyond. After dark we played competitive card games and traded ghost stories. Eventually, we fell asleep on the deck of the boat on mattresses laid out under mosquito nets. We were three to a bed, as cozy as could be, with the song of Borneo’s jungle coaxing us to sleep. It was an incredible trip and is one that I hope that travelers can enjoy for generations to come. But that possibility is threatened every year as more and more of the jungle is destroyed to make room for palm oil plantations. From August to October 2015, huge swathes of the national park were destroyed along with the lives of many of the park’s orangutan residents. If in the future there are many more years that are as bad as 2015, there may not be any orangutans left at all. Go here to read more about how people have to live with the smog and how one of my friends was evacuated during the fires in 2015. Definitely a wonderful and memorable adventure. What a treat to see orangatangs in the wild! So cool Kelly. What a great story of an exciting adventure . A story you’ll love telling over and over again. And three to a bed, hum. Love as always Uncle Dave Fla.